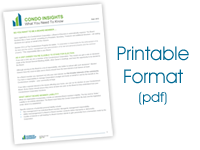 The following covers some common Condominium related terminology that is helpful to be aware of as a condo owner. Those individuals that are elected at the Annual General Meeting of the Owners of the Corporation to operate and manage the Condominium Corporation on the owners’ behalf. Under the By-laws and the Condominium Property Act, the Board must consist of no less than three (3) nor more than seven (7) owners, spouses of owners or representatives of mortgagees. The contract you agreed to when you purchased your home. It governs the operations of the Corporation and sets out the duties, responsibilities of the Unit Owners, the Corporation and the Board of Directors with respect to the maintenance and administration of the Corporation. The By-laws also include the rules of conduct that you are legally bound to observe. A legal notice that is registered at Land Titles against the title of a unit that indicates a legal charge upon that unit. Often used as a method to protect the Corporation’s right to overdue condominium fees. All the remainder of the property that does not form part of any unit. It includes the roof, siding, grounds, parking lots, roadways and decks. The monthly contribution made by each owner to finance the administration, accounting, maintenance and operations of the Corporation. The monthly condominium fee for a unit is determined by the unit factor that is registered on the Condominium Plan for the Condominium. Your unit factor is the number that represents your proportionate share of the total shares of the Corporation. The Survey Plan that was registered under the Condominium Property Act of Alberta at Land Titles. It defines the unit boundaries and the property of the Corporation. The governing statute for Condominiums in Alberta. The Board has the authority to grant exclusive use of the common property to any Owner. For example, a deck or parking stall. Owners are responsible for the maintenance of any exclusive use areas that they have been granted. That portion of the annual budget that is set aside by the Corporation for the repair and replacement of the common property, portions of the units and the Corporation’s property that are not repaired or replaced annually. The premises owned by you. The unit you own as an entity is from the exterior of the drywall surrounding your unit. Anything inside this configuration is your private property and your responsibility. All doors and windows of a unit that are located on the exterior walls of the unit are part of the common property unless stated otherwise in the Condominium Plan. If the plan is silent, or does not specify whether the doors and windows are part of the unit, or part of the common property, the Corporation is responsible for repairs and maintenance.